The Eastern Orthodox Church around the world celebrates Pascha on April 28 this year. Called Easter in Western Christianity, we journey to Pascha, observing the Divine Services that take us from the raising of Lazarus from the dead, His Entry into Jerusalem on Palm Sunday, through each day of Holy Week as our Lord approaches His Last Supper, betrayal, anguish in the garden, capture, trial, mocking scourging & torture, Crucifixion, Burial and finally His Resurrection. Great Blessing of the Waters of Central Oregon. The living waters of the Deschutes River at Drake Park, under the cover of a gentle snowfall – water above and below being consecrated by the Baptism of Christ and Theophany of God!! Theophany is the Feast which reveals the Most Holy Trinity to the world through the Baptism of the Lord (Mt.3:13-17; Mark 1:9-11; Luke 3:21-22). God the Father spoke from Heaven about the Son, the Son was baptized by Saint John the Forerunner, and the Holy Spirit descended upon the Son in the form of a dove. From ancient times this Feast was called the Day of Illumination and the Feast of Lights, since God is Light and has appeared to illumine “those who sat in darkness,” and “in the region of the shadow of death” (Mt.4:16), and to save the fallen race of mankind by grace. The origin of the Feast of Theophany goes back to Apostolic times, and it is mentioned in The Apostolic Constitutions (Book V:13). From the second century we have the testimony of Saint Clement of Alexandria concerning the celebration of the Baptism of the Lord, and the night vigil before this Feast. There is a third century dialogue about the services for Theophany between the holy martyr Hippolytus and Saint Gregory the Wonderworker. In the following centuries, from the fourth to ninth century, all the great Fathers of the Church: Gregory the Theologian, John Chrysostom, Ambrose of Milan, John of Damascus, commented on the Feast of Theophany. The monks Joseph the Studite, Theophanes and Byzantios composed much liturgical music for this Feast, which is sung at Orthodox services even today. 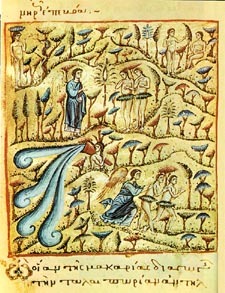 Saint John of Damascus said that the Lord was baptized, not because He Himself had need for cleansing, but “to bury human sin by water,” to fulfill the Law, to reveal the mystery of the Holy Trinity, and finally, to sanctify “the nature of water” and to offer us the form and example of Baptism. On the Feast of the Baptism of Christ, the Holy Church proclaims our faith in the most sublime mystery, incomprehensible to human intellect, of one God in three Persons. It teaches us to confess and glorify the Holy Trinity, one in Essence and Undivided. Author Fr DamianPosted on January 7, 2019 January 7, 2019 Leave a comment on Theophany – God Reveals Himself! A good place to start is to understand ‘what Orthodox Christians do and believe’. Worship God, the Holy Trinity, every Sunday and throughout our daily lives? Of course, . . . the world got its concept of ‘Sunday Services’ from us. Absolutely, . . . we gave the world the Bible it uses, and it is the backbone of our 2000 year history. Like no one else, we know the Lord, God who became man, that all men may be saved. Death. We, who were created in His Image, should not know death. He did not come to make bad men good, He came to make dead men live; to be restored to the fullness of His Glory. “. . . you may become partakers of the divine nature” (2 Peter 1:4). How then was it given to His disciples, and to us now, to live in the fulfillment of this Gospel? And what does this mean in light of St. Paul’s admonition to “continue to work out your salvation “, as well as the commission that Jesus’ teaching and Sonship be preached “even unto the ends of the earth”? Author Fr DamianPosted on May 2, 2018 January 7, 2019 1 Comment on What is Orthodox Christianity? The Sunday after Easter, called the Second Sunday, is thus the eighth day of the paschal celebration, the last day of Bright Week. It is therefore called the Antipascha, and it was only on this day in the early church that the newly-baptized Christians removed their robes and entered once again into the life of this world. In the Church services the stress is on the Apostle Thomas’ vision of Christ and the significance of the day comes to us in the words of the gospel: Then He said to Thomas, “Put your finger here, and see My hands; and put out your hand, and place it in My side; do not be faithless, but believing.” Thomas answered Him, “My Lord and my God!” Jesus said to him, “Have you believed because you have seen Me? Blessed are those who have not seen and yet believe” (Jn 20.27–29). The third Sunday after Pascha is dedicated to the myrrhbearing women who cared for the body of the Saviour at his death and who were the first witnesses of His Resurrection. The fourth Sunday is dedicated to Christ’s healing of the paralytic (Jn 5). The man is healed by Christ while waiting to be put down into the pool of water. Through baptism in the church we, too, are healed and saved by Christ for eternal life. Thus, in the church, we are told, together with the paralytic, “to sin no more that nothing worse befall you” (Jn 5.14). The fifth Sunday after Easter deals with the woman of Samaria with whom Christ spoke at Jacob’s Well (Jn 4). Again the theme is the “living water” and the recognition of Jesus as God’s Messiah (Jn 4.10–11; 25–26). We are reminded of our new life in Him, of our own drinking of the “living water,” of our own true worship of God in the Christian messianic age “in Spirit and in Truth” (Jn 4.23–24). We see as well that salvation is offered to all: Jews and Gentiles, men and women, saints and sinners. The sixth Sunday commemorates the healing of the man blind from birth (Jn 9). We are identified with that man who came to see and to believe in Jesus as the Son of God. The Lord has anointed our eyes with his own divine hands and washed them with the waters of our baptism (Jn 9.6–11). To them He presented Himself alive after His passion by many proofs, appearing to them during forty days, and speaking of the Kingdom of God (Acts 1.3). On the fortieth day after His passover, Jesus ascended into heaven to be glorified on the right hand of God (Acts 1.9–11; Mk 16.19; Lk 24.51). The ascension of Christ is His final physical departure from this world after the resurrection. It is the formal completion of His mission in this world as the Messianic Saviour. It is His glorious return to the Father Who had sent Him into the world to accomplish the work that He had given him to do (Jn 17.4–5).
. . . and lifting His hands He blessed them. While blessing them, He parted from them and was carried up into heaven. And they returned to Jerusalem with great joy (Lk 24.51–52). In the Old Testament Pentecost was the feast which occurred fifty days after Passover. As the passover feast celebrated the exodus of the Israelites from the slavery of Egypt, so Pentecost celebrated God’s gift of the ten commandments to Moses on Mount Sinai. When the day of Pentecost had come they were all together in one place. And suddenly a sound came from heaven like the rush of a mighty wind, and it filled all the house where they were sitting. And there appeared to them tongues as of fire, distributed as resting upon each one of them. And they were all filled with the Holy Spirit . . . (Acts 2.1–4). The Holy Spirit that Christ had promised to his disciples came on the day of Pentecost (Jn 14.26, 15.26; Lk 24.49; Acts 1.5). The apostles received “the power from on high,” and they began to preach and bear witness to Jesus as the risen Christ, the King and the Lord. This moment has traditionally been called the birthday of the Church. This week Lent comes to an end and we turn to the work of Salvation our Lord performed in the Raising Lazarus from the Dead. Then is His Triumphant Entry into Jerusalem, on what has been named “Palm Sunday”. Thus the Orthodox Church begins the celebration of the last week of Christ’s life; officially called Passion Week. In popular terminology, it is called Holy Week. Each day is designated in the service books as “Great and Holy”, with special services every day of the week for the faithful as they “go up with the Lord to Jerusalem” (Matins of Great and Holy Monday). His institution of the Last Supper, His Passion in the Garden, the Betrayal, Scourging, the end of His Earthly Life on the Cross, His Burial and the Lamentations become the focus of our worship, prayer and contemplation during the Divine Services offered in anticipation of the Rising of Christ. All turns to joy, as we begin the Midnight Office in the dark, then candlight procession follows as we visit His Empty Tomb and a world illuminated by the Uncreated Light of His Life-giving Resurrection – the Holy and Glorious PASCHA of our Lord!! Follow this link to read a short summary of the meaning of each of the services, with a schedule so you can plan your week and hopefully attend as many as possible. In the previous post, we have instruction on Great Lent and the fast, but it is important that we continue to explore the deeper meaning of the fast by hearing from the Fathers of the Church. Fasting is a medicine. Fasting is the change of every part of our life, . . . Are you fasting? Show me your fast with your works. Which works? If you see someone who is poor, show him mercy. If you see an enemy, reconcile with him. If you see a friend who is becoming successful, do not be jealous of him! If you see a beautiful woman on the street, pass her by. In other words, not only should the mouth fast, but the eyes and the legs and the arms and all the other parts of the body should fast as well. Let the hands fast, remaining clean from stealing and greediness. Let the legs fast, avoiding roads which lead to sinful sights. Let the eyes fast by not fixing themselves on beautiful faces and by not observing the beauty of others. You are not eating meat, are you? You should not eat debauchery with your eyes as well. Let your hearing also fast. The fast of hearing is not to accept bad talk against others and sly defamations. Let the mouth fast from disgraceful and abusive words, because, what gain is there when, on the one hand we avoid eating chicken and fish and, on the other, we chew-up and consume our brothers? If you cannot go without eating all day because of an ailment of the body, beloved one, no logical man will be able to criticize you for that. Besides, we have a Lord who is meek and loving (philanthropic) and who does not ask for anything beyond our power. Because . . .
. . . We fast to offer our entire selves to the dedication of spiritual things, having distanced ourselves from secular things. So, if there are some . . . who are hindered by somatic* ailments and cannot remain without food, I advise them to nullify the somatic ailment and not to deprive themselves from this spiritual teaching, but to care for it even more. let him have a more intense desire to hear divine words. In this, our somatic illness is not a hindrance. let him distance from his soul every resentment. If he wants to accomplish these things, then he has done the true fast, which is what the Lord asks of us more than anything else. Author Fr DamianPosted on March 16, 2018 March 16, 2018 Leave a comment on Why Fast? our return to the great commandments of loving God and our neighbors, most of all! Let us begin the lenten time with delight . . . let us fast from passions as we fast from food, taking pleasure in the good words of the Spirit, that we may be granted to see the holy passion of Christ our God and his holy Pascha, spiritually rejoicing. Thy grace has arisen upon us, O Lord, the illumination of our souls has shown forth; behold, now is the acceptable time; behold, now is the time of repentance. It is our repentance that God desires, not our remorse. We sorrow for our sins, but we do so in the joy of God’s mercy. We mortify our flesh, but we do so in the joy of our resurrection into life everlasting. We make ready for the resurrection during Great Lent, both Christ’s Resurrection and our own. Generally speaking, fasting is an essential element of the Christian life. Christ fasted and taught men to fast. Blessed fasting is done in secret, without ostentation or accusation of others (Mt 6.16; Rom 14). It has as its goal the purification of our lives, the liberation of our souls and bodies from sin, the strengthening of our human powers of love for God and man, the enlightening of our entire being for communion with the Blessed Trinity. the cessation of lusts, evil talking, lies and cursing. Preparing for the Journey to Pascha! The paschal season of the Church is preceded by the season of Great Lent, which is itself preceded by its own liturgical preparation. The first sign of the approach of Great Lent comes five Sundays before its beginning. On this Sunday the Gospel reading is about Zacchaeus the tax-collector. It tells how Christ brought salvation to the sinful man and how his life was greatly changed simply because he “sought to see who Jesus was” (Lk 19.3). The desire and effort to see Jesus begins the entire movement through lent towards Easter. It is the first movement of salvation. The following Sunday is that of the Publican and the Pharisee. The focus here is on the two men who went to the Temple to pray—one a pharisee who was a very decent and righteous man of religion, the other a publican who was a truly sinful tax-collector who was cheating the people. The first, although genuinely righteous, boasted before God and was condemned, according to Christ. The second, although genuinely sinful, begged for mercy, received it, and was justified by God (Lk 18.9). The meditation here is that we have neither the religious piety of the pharisee nor the repentance of the publican by which alone we can be saved. We are called to see ourselves as we really are in the light of Christ’s teaching, and to beg for mercy. The next Sunday in the preparation for Great Lent is the Sunday of the Prodigal Son. Hearing the parable of Christ about God’s loving forgiveness, we are called to “come to ourselves” as did the prodigal son, to see ourselves as being “in a far country” far from the Father’s house, and to make the movement of return to God. We are given every assurance by the Master that the Father will receive us with joy and gladness. We must only “arise and go,” confessing our selfinflicted and sinful separation from that “home” where we truly belong (Lk 15.11–24). The next Sunday is called Meatfare Sunday since it is officially the last day before Easter for eating meat. It commemorates Christ’s parable of the Last Judgment (Mt 25.31–46). We are reminded this day that it is not enough for us to see Jesus, to see ourselves as we are, and to come home to God as his prodigal sons. We must also be his sons by following Christ, his only-begotten divine Son, and by seeing Christ in every man and by serving Christ through them. Our salvation and final judgment will depend upon our deeds, not merely on our intentions or even on the mercies of God devoid of our own personal cooperation and obedience.
. . . for I was hungry and you gave Me food, I was thirsty and you gave Me drink, I was a stranger and you took Me in, I was naked and you clothed Me, I was sick and in prison and you visited Me. For truly I say to you, if you did it to one of the least of these my brothers, you did it to Me (Mt 25). If you forgive men their trespasses, your heavenly Father will forgive you; but if you do not forgive men their trespasses, neither will your heavenly Father forgive you your trespasses (Mt 6.14–18). Author Fr DamianPosted on January 31, 2018 Leave a comment on Preparing for the Journey to Pascha! In the Christian tradition of both east and west, the twelve days of Christmas refer to the period from Christmas Day to Theophany. The days leading up to Christmas were for preparation; a practice affirmed in the Orthodox tradition by the Christmas fast that runs from November 15 to Christmas day. The celebration of Christmas did not begin until the first of the twelve days. The birth of Christ and His baptism ought never to be divorced. Both events define the Christmas season. It imparts to the Christian the knowledge that Christ’s coming into the world and Christ’s sanctification of the waters makes our new life possible — a sonship by adoption accomplished through baptism. The Twelve Days of Christmas are a festive period linking together two Great Feasts of the Lord: Nativity and Theophany. Days 1-3: The Nativity of Christ is a three day celebration: the formal title of the first day is “The Nativity According to the Flesh of our Lord, God and Saviour Jesus Christ”, and celebrates not only the Nativity of Jesus, but also the Adoration of the Shepherds of Bethlehem and the arrival of the Maji; the second day is referred to as the “Synaxis of the Theotokos”, and commemorates the role of the Virgin Mary in the Incarnation; the third day is known as the “Third Day of the Nativity”, and is also the feast day of the Protodeacon and Protomartyr Saint Stephen. Day 5: 29 December is the Orthodox Feast of the Holy Innocents. Days 6-7: The Afterfeast of the Nativity continues until 31 December (that day is known as the Apodosis or “leave-taking” of the Nativity). The Saturday following the Nativity is commemorated by special readings from the Epistle (1 Tim 6:11-16) and Gospel (Matt 12:15-21) during the Divine Liturgy. The Sunday after Nativity has its own liturgical commemoration in honour of “The Righteous Ones: Joseph the Betrothed, David the King and James the Brother of the Lord”. Day 8: 1 January, at the center of the festal period, is another feast of the Lord (though not ranked as a Great Feast): the Feast of the Circumcision of the Lord. On this same day is the feast day of Saint Basil the Great, and so the service celebrated on that day is the Divine Liturgy of Saint Basil. Day 9: 2 January begins the Forefeast of the Theophany. Day 12: The Eve of the Theophany (5 January) is a day of strict fasting, follows the same general outline as Christmas Eve. That morning is the celebration of the Royal Hours and then the Divine Liturgy of Saint Basil combined with Vespers, at the conclusion of which is celebrated the Great Blessing of Waters, in commemoration of the Baptism of Jesus in the Jordan River. According to Orthodox theology, the steps that Jesus took into the Jordan River were the first steps on the way to the Cross. That night the All-Night Vigil is served for the Feast of the Theophany.